OVERVIEW: Breakout star Daniel Tosh, host of COMEDY CENTRAL's hit series, "Tosh.0," tackles religion, racism and politics with his exceptionally cutting comedic deftness in the World Premiere of "Daniel Tosh: Happy Thoughts," a one-hour COMEDY CENTRAL Original Stand-up Special, debuts Sunday, March 6 at 9:00 p.m. ET/PT. With deliciously twisted and ruthless abandon, Tosh takes on celebrities, sports figures, illegal immigration, the Amish, Mormons and more in this brand new special that was filmed in front of a packed house at the Yerba Buena Center for the Arts in San Francisco. On Tuesday, March 8, "Daniel Tosh: Happy Thoughts," extended and uncensored, will be released on DVD nationwide by COMEDY CENTRAL Home Entertainment® and Paramount Home Entertainment® and on CD and digital album by COMEDY CENTRAL Records®. 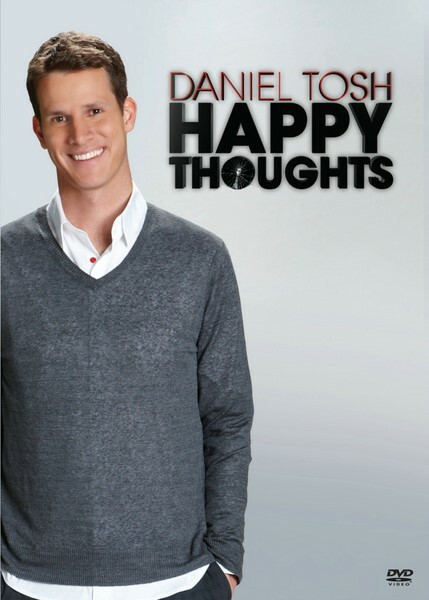 Both the "Happy Thoughts" DVD and CD contains the extended and uncensored performance, and the DVD also features over 60 minutes of bonus material including: Tosh's post-show, encore performance; "A Day in the Life," a featurette filmed exclusively for the DVD that takes fans behind-the-scenes for a day on the set of "Tosh.0," performances by Tosh's opening act comedians Jasper Redd and Matt Fulchiron; as well as the as-seen-on-television cut of the special. "Daniel Tosh: Happy Thoughts" will also be available, extended and uncensored, on download-to-own platforms including iTunes (pre-order Monday, February 28) and Amazon Video On Demand, as well as in standard and high definition versions on Xbox LIVE Marketplace, Zune and PlayStation Store. "Daniel Tosh: Happy Thoughts," a one-hour COMEDY CENTRAL Original One-Hour Stand-Up Special, is produced by Irwin Entertainment and executive produced by Daniel Tosh, John Irwin and Christie Smith and directed by Emmy® Award-winning director Beth McCarthy-Miller. Elizabeth Porter and Jonas Larsen are the executives in charge of production for COMEDY CENTRAL. "Tosh.0" premiered on June 4, 2009 and features razor-sharp humor and biting commentary from Daniel Tosh as he delves into all aspects of the Internet from the absolutely absurd to the incredibly ingenious in this weekly, topical series. Currently, in its third season, the series, which averages nearly 3.5 million viewers each week, airs on Tuesday nights at 10:00 p.m. ET/PT. The comedian has a long history with COMEDY CENTRAL having hosted the network's "Live at Gotham" stand-up series and performed on "Premium Blend" and "Friday Night Stand-Up." Tosh has also been featured on the all-comedy channel in a half-hour stand-up special "COMEDY CENTRAL Presents" (2002) and on his first hour-long stand-up special, "Completely Serious" (2007). His premiere CD, "True Stories I Made Up," was released in 2005 through COMEDY CENTRAL Records. Recently, Tosh wrapped up a sold-out national stand-up tour, "Tosh Tour Twenty Ten: A COMEDY CENTRAL Live Event" which saw him perform in front of more than 200,000 people across more than 50 cities.